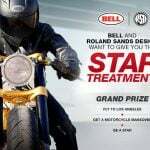 Roland Sands Design releases their 2017 Fall collection with a focus on “armor expansion, innovative materials and unique styles that perform as well as they look.” Finally, it seems most of the new RSD jackets will include elbow and shoulder armor. As the years roll by we find ourselves expanding our riders apparel collection to fit the needs of our motorcycle addiction. 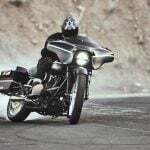 Two wheels is an easy inspiration. Freedom, exploration, friendship, fun and the continuous call of the open road are what we need to keep the midnight fires burning bright. We find there’s no end to the work, there’s no stopping point where we say this is the best it could ever be. It’s a continual process of improvement, learning from where we have been and putting that education to work in the development of our newest collection. 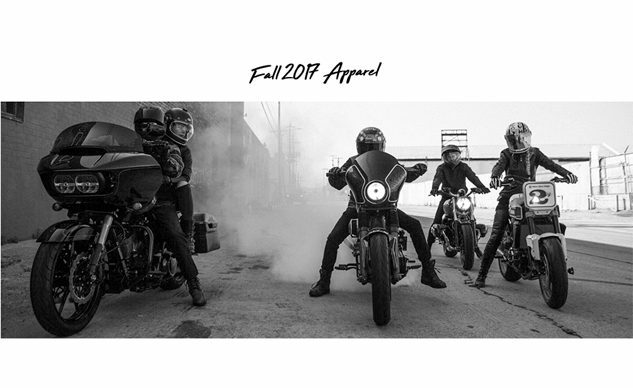 For Fall 2017 we’ve focused on armor expansion, innovative materials and unique styles that perform as well as they look. We’ve remained focused on delivering a lifestyle friendly collection that doesn’t compromise function. This is an idea we will continue to develop and one we feel you will appreciate. 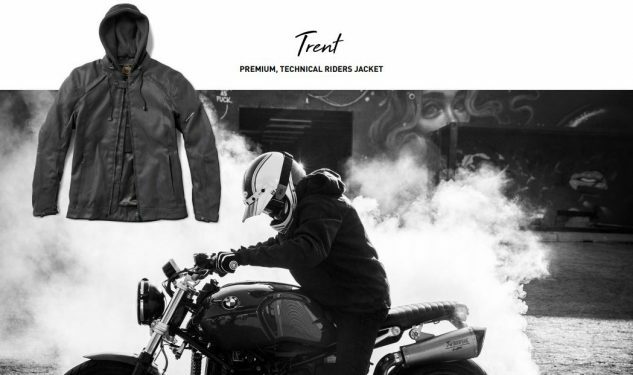 Classic cafe style in an all new stylish hoody jacket, the Trent Jacket by RSD is as versatile as it is technical. Constructed using a durable Kevlar & Cordura fabric blend the Trent jacket provides superior abrasion protection in a lightweight chassis. 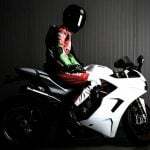 Shoulder intake vents and a large back vent keep the rider cool in warm conditions and the aqua guard zipper by YKK keeps the elements out while in wet weather. And for style points, the Trent also features a removable heavy-duty fleece hood. 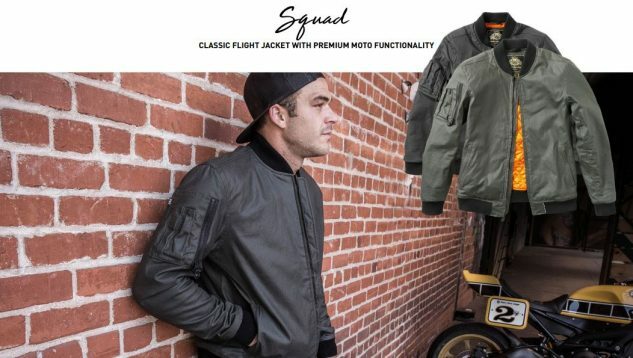 The RSD Squad jacket perfectly combines iconic flight jacket styling with premium moto functionality. The outer shell is a combination of waxed cotton and spandex for a light and flexible feel with a 100% Kevlar mid liner to provide superior abrasion protection. The inner liner is constructed of a soft satin material that is soft to the touch and rendered in bright orange to cap of the classic flight jacket styling. Additional features include a utility zip pocket that is on the right sleeve so it’s usable on the bike and heavy duty flex ribbing on the cuffs and waist band. The Hefe is an evolution of the popular Honcho Jacket. With all new features that elevate this styles form and function. Featuring heavy weight 70/30 denim / Kevlar blend main body that provides top-notch abrasion protection. 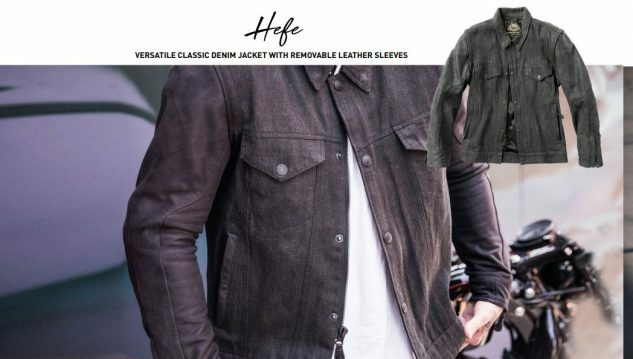 Articulated pre-curved sleeves in premium buffalo feature are fully removable, which allows the Hefe to be a 2 in 1 design that can be worn as a jacket or a vest. Snap down collar, leather accents and classic denim jacket styling, the Hefe is perfect for the rider looking for a versatile jacket that looks great both on and off the bike. The Ramone vest by RSD is the perfect blend of classic style and function. With the ability to be used for layering or with a tee shirt in warmer conditions the Ramone vest is ready to ride. Featuring a vintage inspired design with key details that make this fashionable vest motorcycle functional. 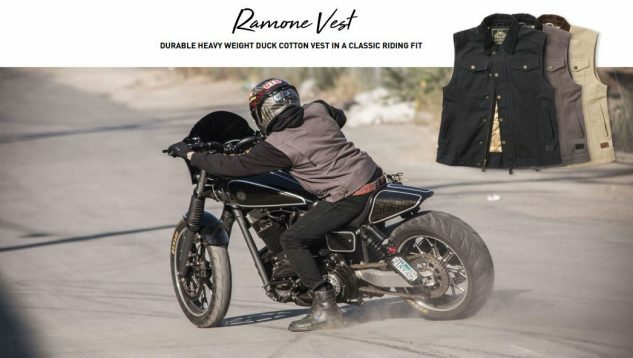 Constructed of heavy weight duck cotton that is abrasion resistant, zip front to keep the jacket closed while riding and snap front flap for that classic look. The soft corduroy collar detail that provides extra comfort. 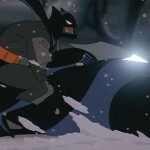 Looking for a classic flannel shirt that will actually provide protection when things get gnarly? The Gorman by RSD has you covered. 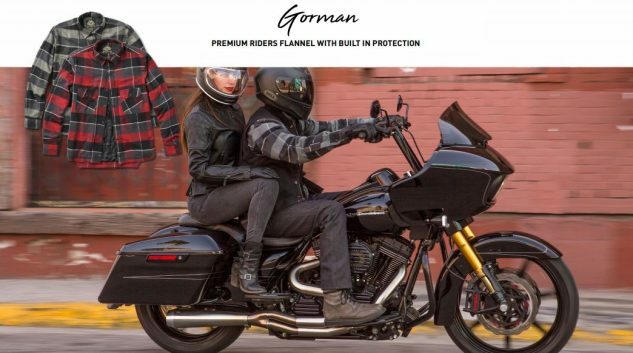 With a fully Kevlar lined construction the Gorman provides the abrasion resistance you would not expect from a flannel shirt. Additional features include a shorty front zip with a snap down slap to keep the flannel closed when you’re getting on the gas. Black ops RSD trims, a quilted liner to block wind and provide some warmth and a riders fit. The Gorman can be fully armored so it’s great for layering with a vest or just wearing it as a jacket. Imagine your favorite hoody with enough built in protection to ride in. 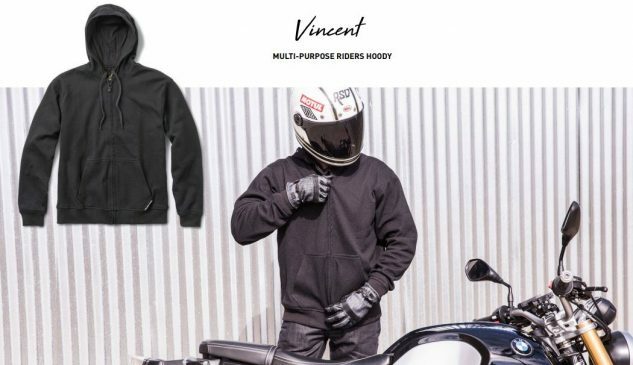 The Vincent Hoody is just that. The outer fabric is a Kevlar Coolmax blend that provides abrasion resistance and moisture control while the liner is a Cordura Nyco material that increases slide protection. The Vincent also features a hidden zipper pocket in the kangaroo pouches and a heavy duty YKK aqua guard main zipper. Old School work glove styling meets innovative materials. That’s what the Launch glove is all about. The Launch glove may look like a vintage denim glove, but they feature a single layer Dyneema denim fabric that is more than 100 times stronger than standard denim. Dyneema fibers are woven into a premium raw denim material and provide superior abrasion and burst resistant protection. The index finger and thumb tips have cell touch layers for smartphone use. With double stitched construction, leather flex ribbing and a double layer cow hide palm the Launch glove is perfect for a rider looking for a classic style that provides modern protection. The Truman glove is a vintage work style glove using classic materials. The top hand is built using our proprietary RSD waxed cotton used on some our most iconic jacket designs that provides abrasion protection and is naturally water repellent. The index finger and thumb tips have cell touch layers for smartphone use. All seams use double stitched construction and the palm is constructed using a double layer cow-hide. The Truman is all about paying homage to timeless design and tried and true materials. 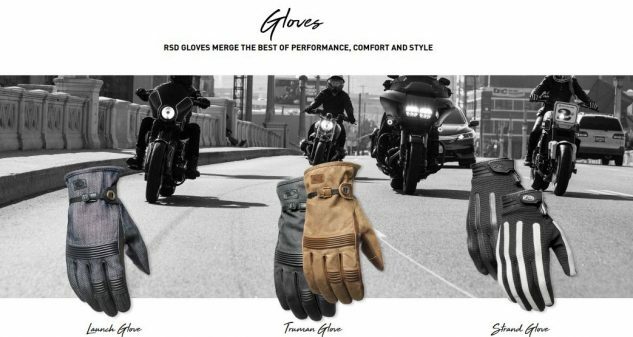 The Strand glove is a classic moto styled glove that is built using lightweight materials. A perfect glove for Hooligan riders, the Strand features a stretch mesh construction that is breathable and flexible and cow hide leather accents that give it bit of a classic moto-x vibe. The palms are built using Clarino for maximum handlebar feel. The index finger and thumb tips have cell touch layers for smartphone use. And the index and middle fingers have a silicon strip for lever grip. See hay, turn left with the Strand Glove. The Trinity jacket blends premium fashion with motorcycle function. This versatile jacket can be worn on ladies night out on the town, or when your carving canyons with the throttle wide open. 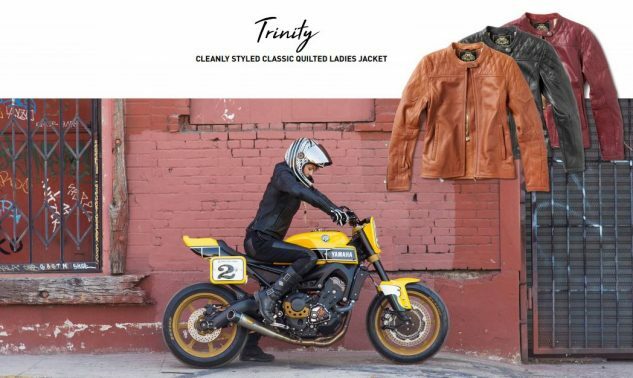 The Trinity Jacket features a semi aggressive performance riding fit, premium oily buffalo leather that is sort and supple and quilt stitched accents that give it just the right amount of attitude.